Libby Chang and Liza Gere at the first women-only monthly meet up for Glass developers. 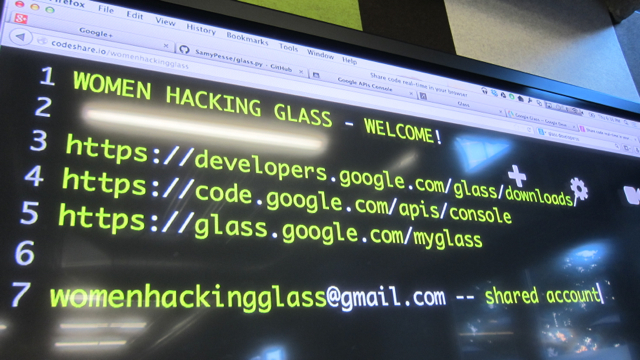 While app-makers still await the official release of the Glass Developer Kit (GDK), a body of test projects has grown steadily since Google Glass' release earlier this year. Early experiments with augmented reality -- including the Field Trip app for Glass, which is now officially available -- facial recognition and even piloting a drone have made their debut to early adopters. Mozilla developer Lukas Blakk welcomes the group to their first meetup. 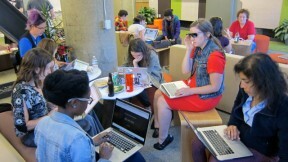 Now some tech leaders are trying to ensure that women get in on the trend too. Lukas Blakk, a developer at Mozilla -- the non-profit organization known best for its Firefox internet browser -- said she wants to help guarantee that the hip new wearable computers are not just for "White Men Wearing Google Glass," as spoofed on the humorous Tumblr blog of the same name. Blakk recently hosted the first Glass meetup for women developers, and said she hopes this monthly gathering will become a regular opportunity for networking and other Glass pursuits. "Part of what I do, as a Mozillian, is create outreach opportunities to empower women in tech with a focus on open source," she said. "So I create curriculum to teach aspects of web development, hardware hacking and anything else I'm interested in learning in order to share the excitement I have for technology and open innovation with others." 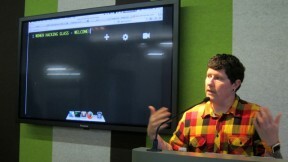 The event was held Thursday night at Mozilla's San Francisco offices. Blakk said that when she first learned about Google Glass -- as well as about how exclusive the initial Explorer program was -- she wanted to get some Glass to share with others. In glancing over the Glass Developers community on Google+, she noticed that only a handful of names/avatars on there indicated a member was likely female. 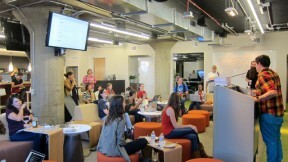 A diverse group of women -- from experienced developers to those new to coding -- joined this inaugural group of attendees. "Right now, there will be Google developers listening closely for feedback on Glass development attempts in the wild," she added. "So we need to make sure women's ideas and the barriers they hit trying to accomplish them are heard." After Blakk welcomed participants to the workshop, everyone divided themselves up into groups based on their expertise with particular programming languages: Python, Ruby, Java, C++ and Android Studio. There were several women, like Tricia Cerone, who are avid Glass users and were interested in connecting with other female early adopters. "Even though I'm not a programmer, it seemed like a great opportunity to get together with women who are interested in Glass," she said. "This is the second event I've been to. The first had about 70 people. There were maybe 4 or 5 women, so this is pretty exciting." As a nurse, Cerone said she is looking forward to seeing how the new technology can be used in public health. 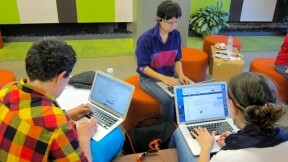 Libby Chang, who works at San Francisco State University's Environmental Health and Safety Department, first encountered Google Glass from her husband. "He got a unit from I/O 2012, and I wore it more than he did," she said, laughing. "I'm kind of interested to see what more I can do with it. I want to learn how to develop, which I haven't done since college when I was an undergrad studying industrial engineering. So this will be a long journey, but it will be worth it." Natalie Villalobos, a Community Manager at Google+, said that many women feel the way to change the world is through non-profit groups. "With the technology industry, actually, it's 'I can build an app for that. I can do my own indie capitalism, build that in my garage, build a prototype, sell it on Kickstarter and get a million dollars in funding," she said. Villalobos said she plans to strengthen her own coding chops. Her "20% time" project at Google is focused on women and technology. She has helped create and oversee a Google+ community called Women Techmakers. One group was led by a staffer from Hackbright Academy, which runs engineering fellowships for women programmers. Director of Operations and Instructor Liz Howard said they are trying to come up with an app that "as you're walking down the street, you can tag locations to visit later and share with friends. So we're just trying to fire up an API real fast, send some slides to Glass and then we'll work on the details of the project later." Anne Spalding, who teaches a web development training program run by Dev Bootcamp, hasn't produced anything for Glass yet. But as a fellow cyclist and skier, she said she hopes to use it for sports. "I think there might be a nice application to graph your speed or heart rate or something else that you would normally have to really look at and process," Spalding said. After trying on a pair of Glass for the first time tonight, developer Susan Salkeld said she is excited over the prospects of wearable technology. "You don't have to pull out your phone anymore, and it's one less thing to have in your hand. I think it might be the future of technology," she said. And as a big fan of NPR, Salkeld said she wants to explore how she can enhance the user experience for public radio fans with Glass. 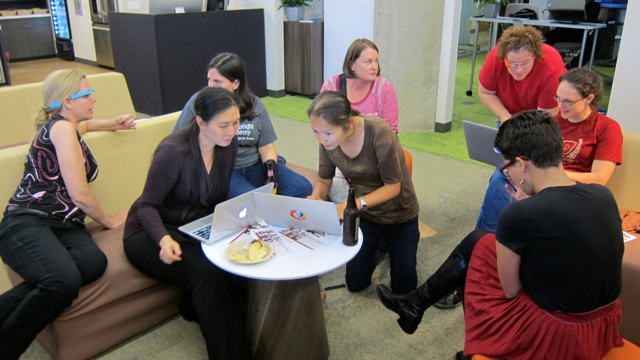 By the time the meetup came to a close after three hours, the women chatted about other projects and made plugs for upcoming events, including an Arduino hackathon and a mobile apps youth hackathon. 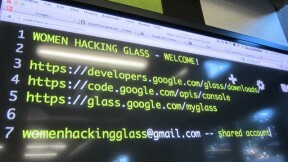 Blakk has already organized the next "Women Hacking Glass" event for October and formed a Google+ community. 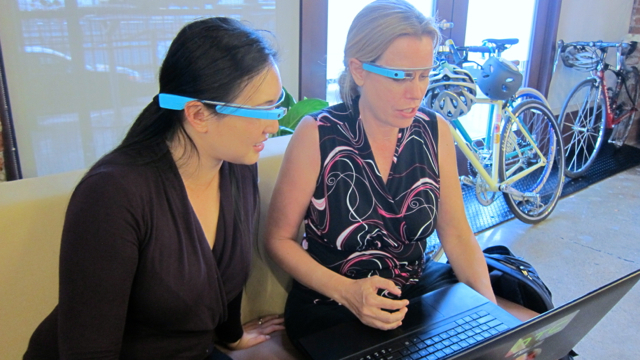 Want to learn more about Google Glass? Check out my ongoing series for KQED Science.